TPR6 PLUS – SEL S.p.A. Textile, paper and food industries. TPR6 PLUS for primary distribution systems has been developed after many years of experience in the secondary distribution with TPR6 series. Compared to TPR6, TPR6 PLUS is characterized by higher performances; its short-time withstand current is up to 31.5kA and rated current up to 2500A . TPR6 PLUS is particularly suitable for power plants with high performances. 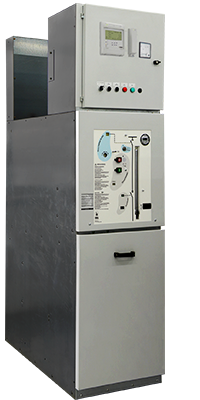 TPR6 Plus is a maintenance-free, factory-assembled and type-tested medium-voltage switchgear. It is three-pole metal-enclosed and SF6-insulated. Vacuum circuit-breaker, switch-disconnector and disconnector modules are available. The core of the switchgear consists of hermetically welded containers made of corrosion-resistant stainless steel, accommodating the primary devices (circuit-breaker and three-position switch). The switchgear is sealed for life. The switchgear modules are interconnected by solid-insulated busbars outside the gas compartments. Gas work is not required, neither for installation at site nor for extension of the switchgear. The operating mechanisms of the vacuum circuit-breaker, three-position switch-disconnector and three-position disconnector are located outside the gas compartment and are therefore accessible at any time. Current and voltage transformers are usually located outside the gas compartment. Cables are connected from the front. They are arranged at one level side-by-side and at a user-friendly mounting height. A wide range of products covering your present and future requirements. Modular cubicles adapted to future extensions. Possibility to mount auxiliary components under voltage. Options to anticipate the telecontrol. Small dimensions and reduced weights for easier handling and installation. During the testing cable operation it is not needed to break the earthing busbar system of the switchgear. Interlock operated by earthing switch prevents unsafe operations. Additional interlocks to prevent incorrect operations. All active parts of the TPR6 are contained in a sealed tank of stainless steel making it deal for installation in difficult ambient conditions. All the control operations are carried out from the front by means of a simple devices. Small dimensions and reduced weights facilitate easy installation. Solutions adapted to cable connection. TPR6 has long service life. Maintenance free live parts which are integrated in vacuum or in a sealed tank of stainless steal. Control mechanisms are intended to function with reduced maintenance under normal operating conditions. High level of electrical endurance when breaking.